This research paper focuses on the inseparable relationship between implied repo rates and equity index total return swaps. Written by Stuart Heath, Director Equity & Index R&D at Eurex, it covers the various aspects and calculations of both repo rates and the TRS. Listed solution for implied equity repo trading via EURO STOXX 50® Index Total Return Futures complement the Eurex suite of equity index derivatives and support the market in complying with new financial market legislation. 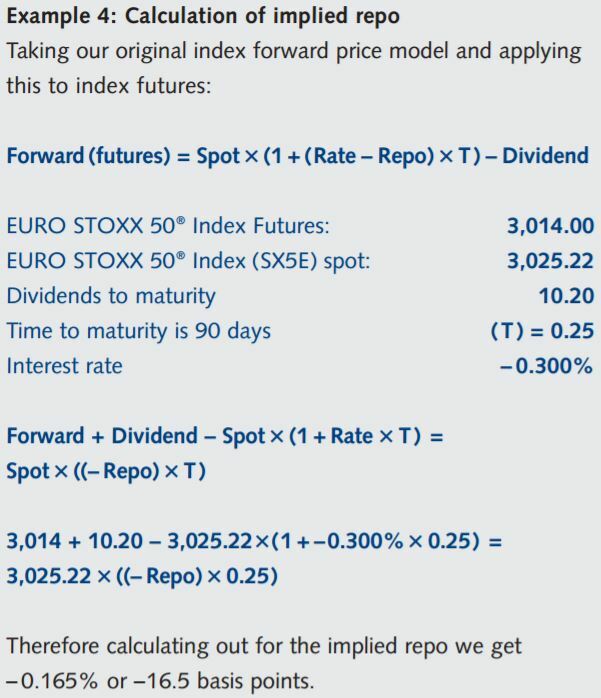 Eurex Total Return Futures are designed to offer listed solutions for trading the implied equity repo rate. Index TRFs aim to replicate the payoff on an index total return swaps (TRS) in a cost efficient way. This research paper focuses on the inseparable relationship between implied repo rates and equity index total return swaps. Written by Stuart Heath, Director Equity & Index R&D at Eurex, it covers the various aspects and calculations of both repo rates and the TRS. Strong negative outlook on equities means that speculators want to sell the stocks to benefit from the stock going down – but of course they need to borrow it to ensure they can deliver it. Corporate actions – can lead in some cases to a possible arbitrage and arbitrageurs would want to benefit from it without taking exposure on the stock, hence they would buy the stock and sell a forward, again putting pressure on the repo rate. Withholding tax – as seen a key element to forward pricing is distributions applied during the reference period. In the case of dividends however these are generally subject to a domestic withholding tax and hence allowances may be made for this. Balance sheet costs – for a seller of an equity index TRS the immediate hedge could be to buy the cash basket in order to replicate the returns – which may have balance sheet costs that would be passed on through inclusion in the spread. Frictional costs – a catch all for items such as brokerage commissions which impact cash basket replication etc. In determination of the forward price the repo rate is subtracted from the interest rate to determine the total financing cost i.e. this amount is the assumed income a holder of the cash index will earn in the repo market. In respect of the equity index TRS the spread is the rate over the reference interest rate that a buyer (receiver) of total returns must pay to the seller (payer) and of which repo rate is the key driver. If the holder of a cash basket can receive income from repo of the underlying stocks then equally the buyer (receiver) of an equity index TRS would expect the spread to be subtracted from the financing cost. Hence TRS spread is (to a greater part) the inverse of the repo rate. In theory, with all things being equal, negative repo rates should be arbitraged away by a simple trade of selling the forwards/futures and buying the cash basket at the current funding rate. The trader can then make risk free profit between the actual repo amount earned and the negative repo rate implied from the forward price (assuming the minimum earnable is zero – but that still implies a profit). A sustained negative repo rate implies that, instead of earning repo from the cash securities held, the dealer is in fact “paying” an amount to remove the securities from their balance sheet. This has in fact been the case since 2013. The key driver is the balance sheet constraints currently applicable to banks under the Basel III reforms introduced by the Bank of International Settlements (BIS) and its implementation in Europe under the Capital Requirements Directive IV (CRD IV). The key impact of this directive is to restrict the traditional financing activities of banks Delta 1 desks as the cost of capital applied to balance sheet use (such as holding cash equities) has made these trades unprofitable. Thus since 2013 negative repo rates have been sustained and equally equity index TRS spreads have stayed positive. In terms of EURO STOXX 50® (SX5E) forward pricing the majority of inputs are directly observable. In particular index spot rate and interest rates are directly observable and distributions such as gross dividends are either directly observable, or if projected, can be hedged with for example the EURO STOXX 50® Index Dividend Futures. The “other” factors in the determinant of forward prices (predominately the repo rate) are usually implied for market prices and are aggregated under the term of “implied repo”. The shorter end of the implied repo curve is determined using liquid index futures such as the Futures on the EURO STOXX 50® Index. We can therefore determine that of the 11.22 index points of basis (cash index – futures price) of the Dec 16 contract, 1.25 index points is due to the implied repo – the rest being a function of dividends and the interest rate funding. The impact of negative implied repo rates has a knock on effect to structured trading and exotic desks – particularly in Europe. These desks in effect sell quantities structured retail products such as autocallables  through which they are selling downside risk. These desks are therefore typically short forward exposure. Short forward exposure brings two additional risk elements. The dealer will be long dividend exposure (a fall in dividends = a rise in forward prices) and long repo exposure (a fall in repo = a rise in the overall financing costs = a rise in forward prices). Whilst dividend risk can be hedged effectively on the SX5E using EURO STOXX 50® Index Dividend Futures, the negative implied repo represents a cost to trading. Typically the forward exposure is hedged using a combination of standard index futures and synthetics (call minus put at same strikes in longer dated options), or by using total return swaps (TRS). Index total return futures represent the final piece in terms of hedging forward exposure by allowing trades to be based on implied repo rates. A buyer of an index total return future, as with a TRS, receives the total returns of the reference index, the equity amount i.e. both capital and distributions. Against this the buyer pays the financing costs in the form of a funding rate plus or minus a spread. The TRF futures unlike conventional futures are priced in terms of the spread in basis points. Index TRFs are structured to replicate the net payout profile of the index total returns. In terms of equity amounts the buyer would receive the gross total returns relating to the reference index. For the EURO STOXX 50® Index (SX5E – a price return index) for example, a buyer would receive the total returns from the SX5E plus any distributions attributable. In the case of the EURO STOXX 50® an additional EURO STOXX 50® Distributions Point Index (SX5EDD) is calculated and the equity amount of the total returns is the sum of these two indexes. 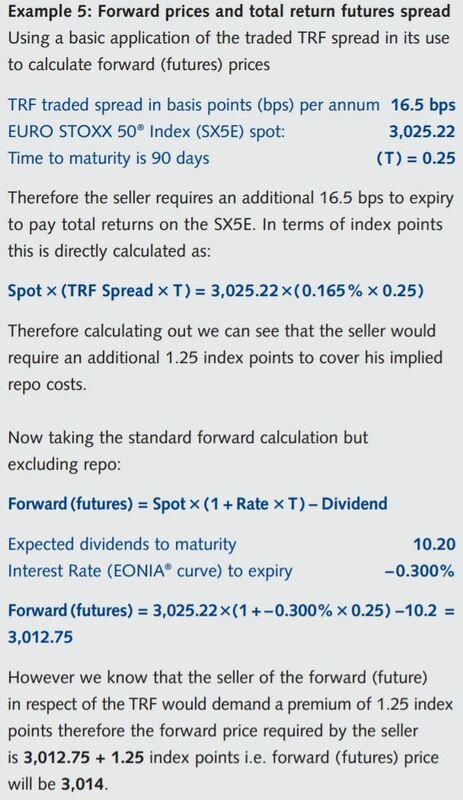 In respect of the financing costs this will be made up of the funding cost attributable to the benchmark funding rate – which for the EUR-denominated SX5E will be EONIA – and the additional spread agreed at the inception of the trade. For the TRFs the benchmark rate will be used to calculate the funding charge for the index and will be netted with the equity amount (i.e. for the buyer will be subtracted from the equity amounts – representing an underperformance due to these costs ). The remaining spread amount will be determined or traded by agreement between the two parties. This will be priced in basis points on an annualized basis and represents the additional cost (if spread is positive) to be paid by the buyer to the seller of equity index returns until maturity. Theoretically in order to pay the total returns to the buyer, the seller would purchase the cash basket and would have to pay the financing costs to maturity – these charges they would naturally pass on to the buyer. The financing costs consists of the benchmark interest rate funding charge (i.e. the borrowing cost for the cash used to purchase the cash basket) less any (positive) implied repo that can be achieved (all other costs are disregarded). In respect of an index total return future the cost related to the benchmark funding rate (EONIA® in the case of SX5E) is incorporated into the daily returns calculation as an underperformance of the equity amount based on the funding amount due. Therefore the outstanding element to be priced is the (implied) repo amount for that index until expiry. A negative repo rate means that financing costs will be greater than the benchmark funding rate as it represents an additional cost and hence the seller would expect the buyer to compensate them for this additional amount. Therefore negative implied repo (which represents an additional cost to the holder of long equity) = positive TRF spread. Therefore a seller would charge an additional spread to the buyer and this is reflected in index total return futures on the EURO STOXX 50® at Eurex which, in common with market convention, is priced in basis points (one basis point = 0.0001 or 0.01%). Hence the key driver in pricing the TRF spread required for any maturity is the implied repo associated with carrying the index to that term of expiry. Eurex Index Total Return Futures (TRF) allow traders for the first time to hedge longer term implied repo. The EURO STOXX 50® Index Total Return Futures will offer at least 5 years of quarterly expiring contracts. For an exotic or structured product desk with a short forward exposure, buying the TRF will hedge both the forward exposure and implied repo. The TRF contracts can additionally be used to hedge or trade forward implied repo associated with longer dated structured products. For example selling a five year TRF and simultaneously buying the one-year TRF expiry in the same amount – will result in a net position of selling implied repo for four years – one year forward. In this case all of the other returns of these legs (equity index, distributions, and EONIA funding) will cancel out of the first year. Autocallable is a feature of an exotic option that is often found in structured products with longer maturities. A product with an autocallable feature would be called prior to maturity if the reference index is a predetermined index level on specified observation dates. The investor would receive the principal amount of their investment plus a pre-determined premium (or a coupon) and the product terminates. The term “costs” in this instance is based on a premise of positive interest rates – in a negative interest rate environment this will be inverted and will be positive in terms of performance.